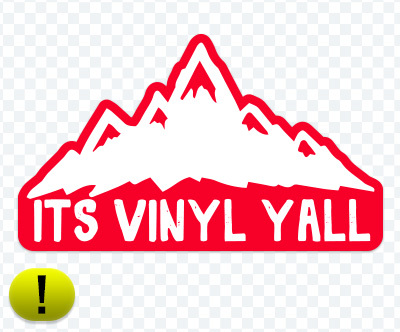 The It's Vinyl Y'all logo comes in two flavors, horizontal and round. Both of these logos are always in the IVY Green. This logo is to be used when vertical space is a premium but horizontal space is not. Things like business cards where names and information need to go below the logo and not to the side of it. It also contains a short tagline about what services we offer - so it's more suitable for advertising than the round logo. This logo is more of an "icon" and can be used in branding materials where it's not used as a header. 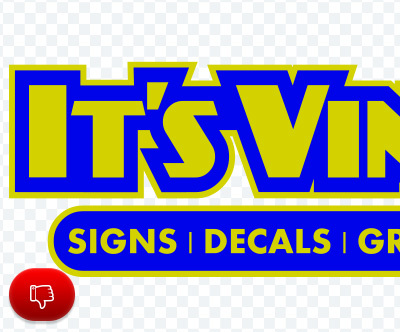 This logo is perfect for applications such as window decals, stamps, and other instances where it is used more in promotion than advertisement - as it doesn't contain the tagline "SIGNS | DECALS | GRAPHICS". Currently we have one standard variation of the logo and it's to be used when on a cluttered, colored, or busy background to help it stand out. The horizontal logo variation has a white stroke around it with a weight the same as the width of the counter in the small A in "DECALS". 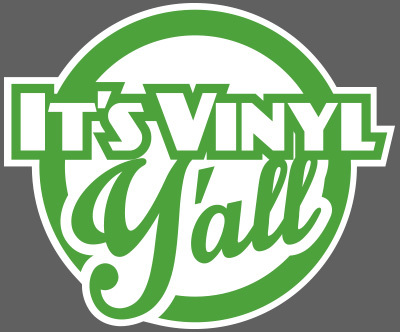 The interior of the IT'S VINYL Y'ALL lettering and the letters in the tagline are also white. Do not substitute another color for white. 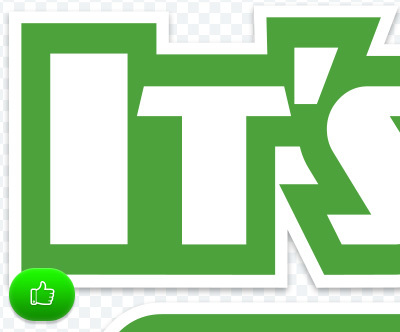 Only invert the green and white if it is presented on a green background. 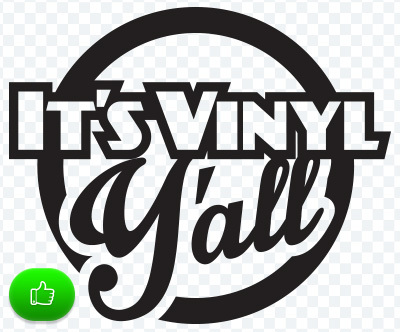 The round logo variation has a white stroke around it with the same width as the width of the bottom of the apostrophe in "Y'all". The interior of the IT'S VINYL Y'ALL lettering and the inside of the circle are also white. Do not substitute another color for white. Only invert the green and white colors if you're placing it on a green background. Here are a few examples of what should be done with our logo. If you have any questions or are uncertain of how our logo should be used, please feel free to contact us. Do feel free to resize our logo to make it larger or smaller. Feel free to add things around the logo and outside of the white border on the variation version like drop shadows, outer glows, etc. We've made several patterns based on our logo. We've even wrapped our shop truck and motorcycle in variations of these patterns. Please contact us if you'd like us to send you one of these patterns. Do Not alter the colors of our logo to outlandish colors. If it's suitable to make it a light gray for a watermark, black, white, or another simple color to suit the application, that type of modification is allowed. Do convert our logo to black and white. Feel free to make our logo either black or white. When using the white-stroked variation of our logo and making the lettering white, you must use a black stroke. 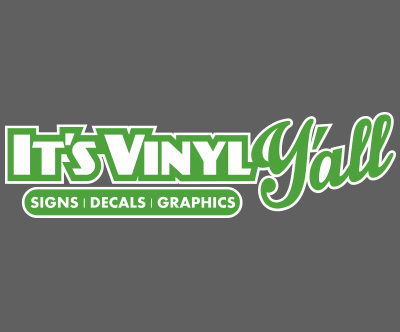 From time to time we will make a run of decals for the shop. 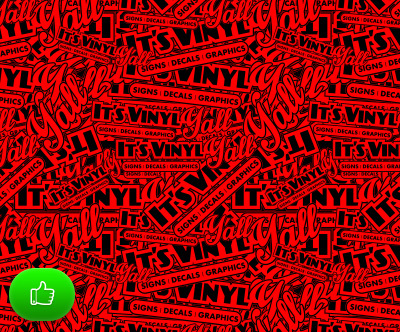 These may or may not adhere to the rules outlined above and are meant to be fun themed-decals. Please contact us before altering our logo and distributing it. Do Not crowd our logo or let anything overlap it. Our logo should stand alone and be given space around it for ease-of-readability purposes. We only have one real color in our brand-theme and it's the IVY Green. This is the color to be used in the logos for things in advertising and branding materials such as headers, background colors, etc. The typeface used in "IT'S VINYL" and in headers for most of our advertising and promotional materials is called Day Poster Black. The typeface used in the tagline on our horizontal logo and as body copy in most of our advertising and promotional materials is called Keep Calm. 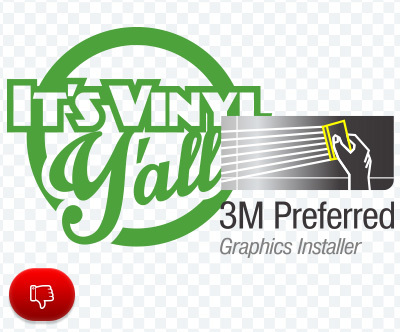 Display these graphics in a way that implies a relationship, affiliation, or endorsement by It's Vinyl Y'all of your product, service, or business. Alter these graphics in any way, or combine them with any other graphics, without written consent from It's Vinyl Y'all.